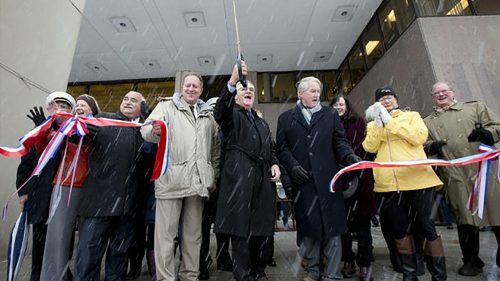 On November 15, JMT Architecture attended the ribbon cutting ceremony to celebrate the completion of Patriot Plaza. Despite wintry weather, our team, along with other community supporters, watched as Baltimore County Executive Don Mohler officially unveiled the new green urban space. The Plaza, designed by JMT Architecture and JMT Landscape Architecture, will serve the Towson community by providing park space in the heart of downtown Towson. The renovated space includes the fire and police memorials and a new commemorative plaque dedicated to former County Executive Kevin Kamenetz who passed away earlier this year, but who was a leader in bringing this space to life. The ribbon cutting was covered locally by a number of sources, including The Baltimore Sun, Patch.com, and Baltimore County Government.